The latest game in the Call of Duty franchise, Call of Duty: Black Ops, will be 3D compatible. The announcement by Treyarch, makers of the game, is a significant one for the 3D format, as not only is it one of the biggest games franchises of all time using 3D, it is not tied down to any one console. 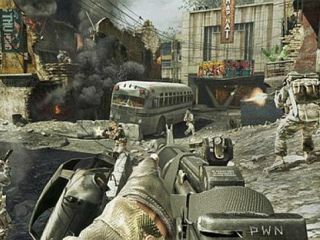 The 3D version of Call of Duty: Black Ops will be available for the Xbox 360, PlayStation 3 and the PC. All you need for the console versions is a 3D ready TV/monitor for the game to work (and stereoscopic glasses). For the PC version you need a PC with Nvidia 3D Vision technology inside. Mark Lamia from Treyarch said about the news: "Development of stereoscopic 3D began as an R&D project, but once we saw what the technology brought to the Call of Duty experience, what a great fit and how immersive it was, we knew that we had to develop it for Black Ops. Lamia continued: "We made sure the experience is seamless for gamers to use with a simple menu option to enable stereoscopic 3D or disable it at any time whether playing in the single player campaign, multiplayer or Zombies." Gaming has always been flagged as one of the driving forces behind 3D in the home and there will be no bigger release that Call of Duty: Black Ops this year. So it will be interesting if the game has a significant impact in the sales of 3D TVs, when it is released in the UK 9 November.